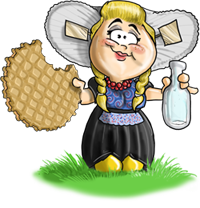 On all orders within the EU, Yummy Dutch charges VAT. The VAT percentages are 6% on food products and 19% on non-food products. Furthermore, if VAT is charged, then this will also need to be charged on the delivery costs. On orders outside of the EU, Yummy Dutch does not charge VAT. Orders from companies, within the EU who have a valid VAT ID are able to fill out their VAT ID, which will be checked on validity. If the validity check returns succesfull, Yummy Dutch will not charge VAT and you are obliged to pay any VAT charges in your own country of delivery. When making the payment, the following details are stored in our own database: name, address, postcal code, state, country, optional VAT ID, email address. Your financial data will not be stored in our database, nor the database of the biller. You are able to specify a different delivery address than the billers address. However, keep in mind that when ordering products for someone else, you possibly force someone into paying inmport fees and VAT charges when the products cross the border of the country of delivery. By using our website you automatically agree with our Terms and Conditions as set out above. If you have any further questions you can contact us by following the contact link in the menu on the left, or at the very top of this page.